From rum/Tequila mash-ups to unlikely combinations of Cognac and sweet wine, hybrid spirits are increasingly in vogue. Now, as whisky also gets in on the act, are these products welcome innovations or threats to the integrity of Scotch? Tom Bruce-Gardyne reports. ‘Don’t mix your drinks’ is an age-old tip passed from one generation to the next and routinely ignored. It seems we must learn the hard way that combining pints of beer with red wine, copious whiskies and a Tequila slammer is bound to end badly. Yet into our personalised, belly-shaped blender all must go for a vigorous shaking on the dance floor and a guaranteed glimpse of hell the next day. Within the bottle you can also mix pretty much anything and label it as a new hybrid spirit, such as Malibu Red – ‘a vibrant fusion of smooth Caribbean rum and fiery Mexican Tequila’. If your brand needs a boost, simply catch the latest wine craze, be it Kiwi Sauvignon Blanc with Absolut Tune, or sweet Moscato in the case of Courvoisier Gold. As for flavoured vodka, just think of what’s out there, from bacon and bubble-gum to peanut butter and jelly. Ever wondered what connecting your mouth to the mains might feel like – an unbelievable buzz? A new hairdo? Instant death? Try Oddka Vodka’s ‘electricity’ flavour and find out. Leaving aside short-lived RTDs such as Bell’s & Irn-Bru and flavoured ‘spirit drinks’ such as Dewar’s Highlander Honey, Scotch whisky has steadfastly refused to join in the fun. Its rules are notoriously strict, which is either a source of strength through purity, or a stifling of innovation – depending on your viewpoint. 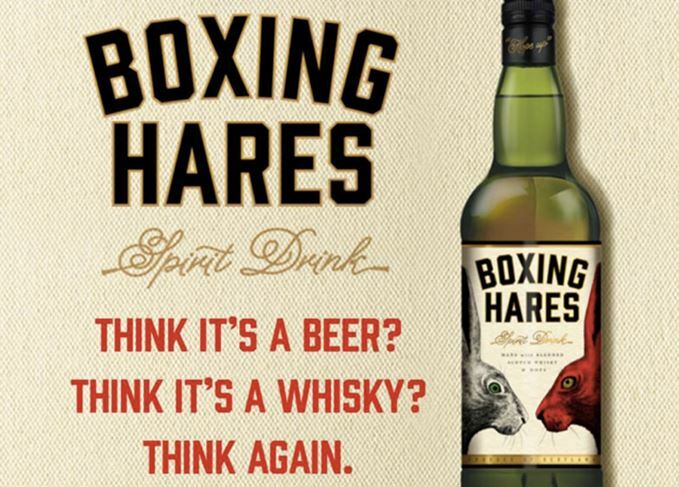 To ease the pressure, Diageo unleashed its principal liquid scientist, Pete Brewin, to create Boxing Hares – a hop-infused whisky to surf the craft beer boom. It was the first ‘hybrid whisky’ of Diageo’s new Whiskey Union project, and has just been joined by Huxley, a mash-up of Scotch, Canadian and American whiskies. While the other whisky giants decide whether to jump in, we asked two of the smaller players to debate the merits of such creative wizardry. To put it plainly: Are hybrid whiskies good for Scotch? ‘The food and drink sector has seen its fair share of fusion over the years – some have been successful, others may have piggybacked with less integrity, but finding the likes of Highland Wagyu on a menu still has the potential to stimulate the taste buds. ‘The concept of blending whiskies of different country of origin is not completely new either. Scotch has been added to Japanese whisky blends (in Japan) for many years, but never marketed as a fusion. Other hybrid whiskies have appeared more recently, some looking to play with different flavour possibilities, others for more practical reasons. ‘My own involvement in this category stemmed from a fortuitous meeting with Edinburgh-based Thomas Blake Glover & Co in early 2015. They asked us to bottle a Scotch whisky to raise awareness of Thomas Blake Glover’s role in shaping modern Japan. ‘Glover was born in Aberdeenshire in the early 19th century, but left for Japan at an early age. He would later become known as the Scottish Samurai because of the profound impact he had on the modernisation of the country. He was also the first foreigner to receive the Order of the Rising Sun from the Japanese Emperor in recognition of his many achievements. ‘It seemed only appropriate that we should offer to create a designated fusion whisky to celebrate his life, and it became an incredibly rewarding and educating project for us all, despite the practicalities of international procurement and production. ‘With a genuine reason established, we also had the opportunity to highlight the unique flavours of both countries, and create a blend that was even more than the sum of its parts, and that is the part of fusion that has always excited me the most. ‘I am even more delighted to be involved with and promoting this now, when so many quality new whisky distilleries are appearing globally. With a tried and tested logistical method of creating these fusions, we now have the opportunity to add to Scotland’s own regional styles and enjoy each new marriage of international flavour. ‘As a relatively new company, R&B Distillers are fully aware of the need to be innovative and different. After all, it is our ambition to be the leading hand-crafted whisky producer in Scotland. Enjoying a dram of The Glover, it is hard to get too stressed about this brave new world of whisky. The trouble is that not all such innovation is conceived with the same good intent. The shelves are littered with crass attempts by spirits brands to leap on the latest trend for a short-term gain. What happened with vodka should be a warning to whisky, and while the sickly tide of confected flavours has waned, those who made them are still around. Who knows? Perhaps they are down in the lab cooking up some ugly Franken-Scotch to trash the spirit we know and love. Hopefully not!